It was cold for a Phoenix morning (upper 30s over-night) and I stood outside the hospital splashed in sunlight, surrounded by palm-trees and (oddly) shivering despite my wool army-drab button-down and $3 coffee. The doctor’s visit went well and my spirits were high. Surgery was not an option. For now. A few minutes later, my host arrived in a green VW Rabbit. I love the new rabbits. She needed to get some work accomplished and I needed to address some email. A few (Phoenix) minutes later, we arrived at the coffee-shop. I ordered a mug of coffee and picked up a business card. Lux? That sounds familiar… Oh my goodness! LUX! I shot their first cover on top of the Smithfield at 5.30 on a Sunday morning in 2007 and the magazine was named after the coffee-shop in Phoenix where Mark and Cindy birthed the idea. The West is a unique place. The cities are different – spread out. The architecture is different, too. I can’t describe it. It just feels like it belongs here in the desert. Form over function. Matt’s fits in just this way. It’s tiny inside and everything’s painted white. A few photographs in white mats with white frames take up the rest of the wall space. 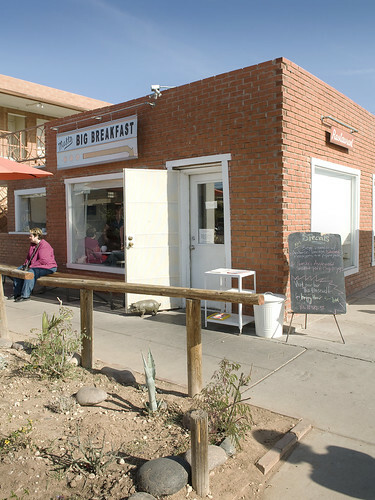 The small bar occupies a quarter of the main dining area and four diner-orange tables decorated with desert plants take up the rest of the crowded and intimate space which is by now teeming with locals who’re there to gather a late morning brunch. There were two specials that morning and once our server mentioned the first, I couldn’t remember anything else, but I told her that I needed some more time so that I could neatly arrange my table for a shot of the menu. 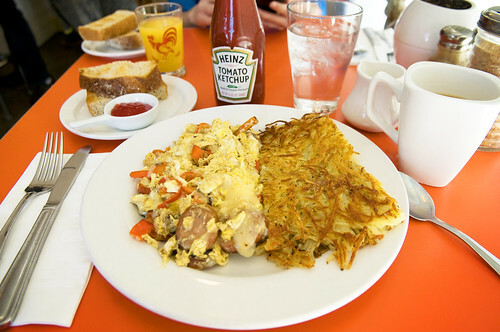 When she came back I ordered the three-egg scramble with red peppers, spicy sausage (all their pork comes from Iowa!) and provolone cheese. A side of shredded hash-browns accompanied this beautiful breakfast feast. For a joint that stays as busy as it does, the prices are fantastic. (I think everything’s cheaper in Phoenix). Before tip, my tab was right around $12 and for the quality and quantity of food that I received in one of Phoenix’s most popular spots, I had no complaints. When I make a return visit to the Valley of the Sun in April, I’ll be sure to make myself an out-of-town-regular at this wonderful little place. …And maybe next time I’ll run into Nate Ruess.